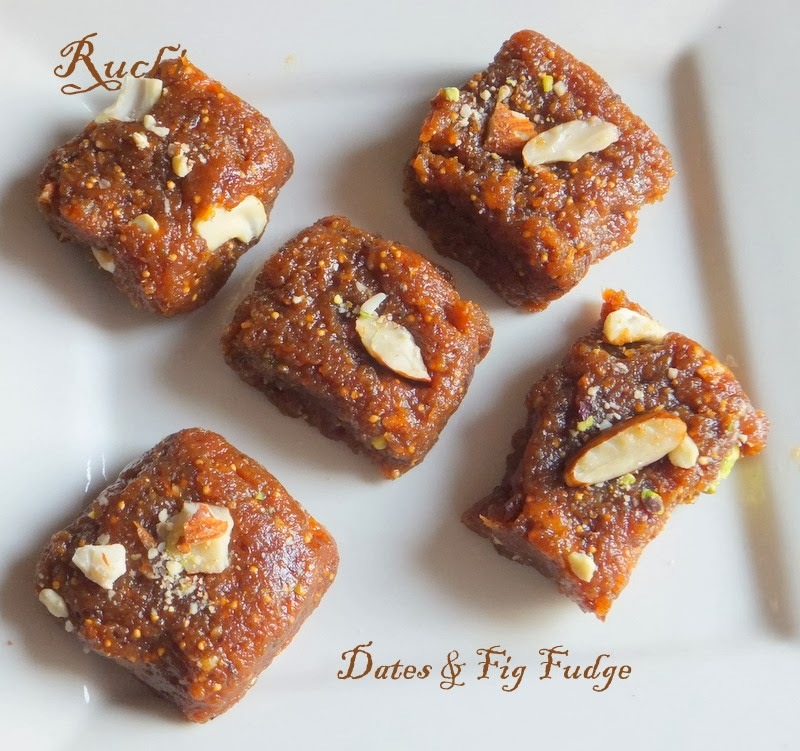 Figs & Dates Burfi is a nutrient packed mouthwatering dessert recipe. figs or Anjeer cooked with dates. It is a very easy to make and delicious desert. The health benefits of figs and dates are too many. Figs are a good source of dietary fiber, potassium and manganese. The date fruit pulp is very sweet something similar to honey or sugar syrup. Dates gives instant energy and revitalizes the body instantly.The adding of almonds, cashew and pistachio makes it more healthy and increases its nutritional value. Best part about this desert is that it has no added sugar and it is made using only natural ingredients. I made this Burfi for Bhogi Festival. 1) Soak figs in about a cup of hot water for about 5 minutes. Add dates to same bowl and soak for another 2-3 minutes till they are all soft and plump.Grind them into a puree (keep it bit coarse) and keep it aside. If needed add little water. 2) Take a small pan and lightly toast the nuts separately for 2-3 minutes each,and allow them to cool. Then coarsely chop all the nuts and set aside. 3) Heat a heavy bottomed, wide pan on medium and add ghee. When ghee melts, add the fig & dates puree and cook for about 10 minutes, stirring constantly and making sure not to burn it. 4) When it seems like there is not more moisture in the mixture, and it starts to leave the sides of the pan, add the chopped nuts and mix well. 5) Cook another 5-7 minutes and Remove from heat. Grease a plate and transfer the mixture and make sure it spreads evenly. 6) Cut into square pieces & serve!